LastBrunnenGstanding wrote: When we went to the nickel dinner in downtown LA, like 3 or so blocks was city hall. Was some site to see a glimpse of occupied LA and the 13 news vans that I saw more were there I am sure. It was impressive I would have taken a picture but my hubby thought it might be unsafe. I have bad luck with wrong place wrong time thing so we left. The next mourning the news said they were going to start the eviction order. But I don't think it went through yet? LBGstanding, certainly every chance for interaction with strangers carries with it the potential for confrontation, and it is prerogative of everyone to act in the interest of their own safety. I would not second guess the assessment of your husband. On the other hand - and without intending to make it seem that I would be so pompous and absurd to attempt such criticism regarding the specific situation you describe without myself having been there - I will say that there is sometimes the potential for allowing concerns about safetly to unjustifiably act as a barrier to communication between classes or between those engaged in protest and those witnessing it. As I've previously written, I've participated in protests, and when I did so I always viewed such activities as an great opportunity to engage with others who were not protesting in some discussion. The OWS movement has been widely (mis-) portrayed in the media as simply a grouping of grossly unsanitary, ill-behaved, and - just plain crazy protesters - but that is a very small part of it an there is far more nuance involved. I suspect that if you had found it justifiable to take a chance on interacting with the protesters - rather than simply snapping some pictures which might be conceivably be seens as a touristy, or imparting of a zoo-like atmosphere on the situation - you might have found some neighbors for whom you might have some kindred feelings and even respect for. From my own experience I know there are quite a few more books in the tents, boxes, and shopping carts of even the 'lowliest dregs' of society than we might tend to give credence to, and those engaged in protest aimed at saving our democracy tend to be of a far higher caliber than is suggested by their accommodations. Right before Thanksgiving USA Today did a cover story on OWS and the types people who were involved in the protests and many of those involved are respectable middle class citizens, students, professionals etc. It is not simply a collection of lazy unemployed malcontents. The movement is a true cross section of American society. No, locals there at the monets that we saw to talk to and ask questions. I wanted a picture to remember what I saw first hand. I didn't think it was a zoo atmosphere at all the opposite thought came to mind. I was very curious I wanted to check it out for a bit. Talk maybe to a few people at the side walk from the camp. They didn't seem threatening of menacing to me at all. They seemed energetic and excited and ready. Nothing negative came to mind I wish we would have talked to a few of them and hear the story from the source itself for once. My husband said it wasn't safe because things seemed to get a bit tense with the cops and media been there. Also it was getting dark to him it wasn't the best scenario for us to bring our son into. So I think it was a good call I think he had the best interest and well being for us. Now if we would have been there earlier and in the day with out the cops and news people there. It be less tension less frustrated people and they would be more relaxed and I think more easily to approach. That's my opinion, that things be more pleasant for us to check out with out in the picture. We have never seen a protesters camp or a protester in person we have never been involved in one so we have the right to be cautious. For what I observed they seemed peaceful and welcome anyone who has questions for them. I wanted the picture to say i was there and they are fighting to bring change. I take pictures of meaning full objects, family so on and so forth things i think are meaning full and important. To me that site was that meaning full important and history in the making and i just wanted to remember it. Be_you_ I was enlightened by my brief experience. Personally if you asked me six months ago if a protest of this magnitude would have erupted I would have laughed. This particular movement has restored a small part of my faith in this country. I was under the impression that everyone was too lazy and did not care about what was going on in their own country, but now I realized there was more people than I believed that shared the same views as me. Its was really something else to see a glimpse of it at list first hand. It was small compared to the one in SF or downtown san Jose. But the message they are sending is as impact full. Well said higgs boson good thing to see change for the better. There are people who are beginning to take notice of what is going on around them...finally. And supposedly one of the biggest distractions of the past 10 years will be completely removed from the mix by Dec 31st. Yes the troops should all be home from Iraq by the end of the month. 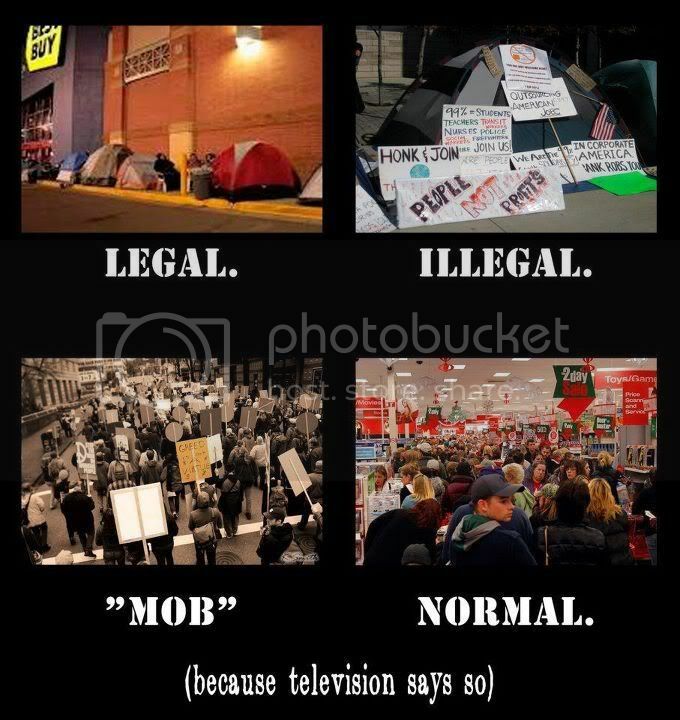 But I have been watching the growing Government trend of 'criminalizing' the protesters. We are seeing these peaceful protesters getting 'evicted' from public property across the nation. We are seeing more violence breaking out also, as usual there is an attempt to turn the protesters into the enemy. What we have to do as Americans is to realize that the only way to end the economic status quo is to do what needs to be done to get rid of those who support the status quo and that is very easily done with an election year coming up. We have a power called the ballot box it's up to us to realize the power of our vote and use it. Recent polling shows that the anti-incumbant feeling towards congress is indeed higher than its been since 1946. Too bad we won't have any great choices to make for the executive branch. In a recent analysis by one of my heroes, Cenk Uygur, he said he was actually leaning towards Ron Paul - despite all of Paul's shortcomings - as his disgust for Obama's performance is so very profound. Compelling stuff. Sometimes it's not about having a good choice but making the point that the position is precarious. Without teeerm limits, The majority of congress begin to develop a sense of 'ownership' of their position. They have to be made to understand that they hold these positions at the will of those affected by the decisions made. When that message gets through loud and clear, the politicians will begin to understand what the founding fathers had in mind when they broke from England (For many of the same issues we face today) and created this country. Good one LBGstanding. When tent dwellers and flash mobs are responding to the command to behave like mindless atoms of consumption, all is well. When they are autonomously exercising their non-commercial political voices, big no-no! I thought it was a good one to I agree very simple but effective way to prove a point. how it's ok to be mob like and camp out over night to wait for the best deal for an xbox. or whatever but when it's done to try to make change and have people hear their voice heard then it's not right very weird.